I'VE ATTACHED A FILE SHOT AT 12,800 ISO. Feel free to pixel peep, and play around with it. If you decide to try and edit the photo, share it with me! One of the biggest things that photographers try to avoid is noise. (Grainy photos caused by bumping up the cameras ISO to help expose the photo). Is noise really a bad thing? No it's not. Noise is not something to be scared of at all. I hear people say things like "the D5500 can't handle much higher than 1600 ISO before the photos are unusable" this is absolutely not true. Do the photos have noise? Yes, but the photos are absolutely usable. Obviously when shooting at higher ISO's the image quality, and dynamic range begins to degrade, but for the most part you really don't have to worry. If you shoot RAW, you can always edit and bring back some details in post. When you're looking at a photo and you're seeing noise, is it because you're zoomed in and pixel peeping? If so, of course your seeing noise when your zoomed in 1:1. That same photo looks great and noiseless when printed because you can't pixel peep a print. One huge tip to keeping your image quality up, and noise down is to make sure you get your photo properly exposed in camera. If you are using high ISO and still accidentally underexpose your photo, bumping up the exposure in post will really quickly degrade image quality and create tons of noise. I've taken photos at ISO 12,800 that I've used because I exposed it properly in camera. If I shot that same photo at 12,800 and had to bump up the exposure in post, it would have been trash. In summation, don't be afraid of using high ISO, and don't be afraid of a little noise. Just make double sure to expose the photo properly in your camera when using high ISO or you'll hate yourself when it comes time to edit. I'm launching a new segment of videos called "Your Photos Exposed" where I go over, and critique your photos! All you need to do is upload 5 of your best photos to a website like 500px, or Flickr, and send me the link through one of the submission pages on the site. I will be randomly picking submissions for critiquing so if you're not picked right away, keep submitting and hopefully you'll get yours chosen! NOTE: Do not send me links to your Instagram page, I will not be critiquing photos on Instagram. This is a great opportunity for you to get an honest perspective on your photos. I will give you advice on what you're doing right, and what I think you might be able to improve upon. Let me start by saying I really wanted to love the d7500, I really did. Now that's not to say that I HATE it, but upon looking at the specs I have to say it really left me wanting more. After a little while of complaining it dawned on me what the d7500 is meant to be, and it made me appreciate it a little more than I did at first. I'll explain in a moment but let's start with some specs. Wait...is that it, is that all I see that bothers me about the d7500? I guess it is. So why was I upset? I was upset because it feels like a half assed step up from the d7200. The d7200 has a good sensor, dual memory card slots, 6fps, full HD (no 4K), 51 focus points. Over all, it has very similar specs to the new Nikon d7500. But realistically what did we expect? When it comes to the 7000 series, every new model has sort of been a baby step from the last. Nikon likes come out with a killer brand new camera (something like the d500) and then take the sensor, and few other aspects, and toss it into a 7000 series camera. Which honestly makes perfect sense. It's not supposed to be a ground breaking camera, it's just meant to be a more cost effective version of the ground breaking camera. If they didn't come out with this d7500, the line up would start to be stale and outdated. Now I know what you're thinking. And yes I absolutely agree. The one thing that really bothers me is the fact that they did away with the dual memory card slot, I can't wrap my head around that decision but they must have their reasons, or else they wouldn't have done it...right? All in all if you're looking for a revolutionary, ground breaking, camera the Nikon d7500 isn't it. But, If you're looking for a good mid-high end camera, that shoots 4k, and will handle well at higher ISO's, this isn't a bad option at all. Just be weary of not having the back up memory card slot. I say If you really want to upgrade and can justify the cost difference, the d500 is still certainly the way to go. I recently was approached to do some head shots for an actor. He needed updated shots, so we picked a day and went downtown. I took my Tamron 70-200 f/2.8 macro with me and a bunch of gear. (3 Flashes, umbrellas, tripod, stool, reflectors etc.) I only ended up using the 70-200, the stool, and the reflector. I think the photos turned out absolutely great, and I took them all with an "old" lens. Thats the thing about camera gear, you don't NEED the newest, best gear to capture great photos. You just need to know how to take great photos with the gear you have. In this case, I needed to make sure that my shutter speed was fast enough to compensate for my shaky hands (because this lens doesn't have any vibration control). I also knew I needed to have a nice low aperture so I could blur out the background. Lastly, I needed to make sure I was hitting my focus properly. The Tamron 70-200 Macro is a bit soft when its stopped down to f/2.8 and used at 200mm. I had to be mindful of this, or it would result in a very soft image which is the last thing I'd be looking for in head shots of this nature. TIP: If its really sunny outside, place your subject in the shade and use a reflector to bounce some ambient light back on to their face! Here are some of the images that I personally like the most from the shoot. A lot of people think the key to getting great pictures is the camera, or the lens that they use. I can't count the amount of times I've heard something along the lines of "if only I was using THIS camera." or "if only I had a better lens." Let me tell you right now that if you're that person, you need to cut it out. It's absolutely possible to take stunning photos with nearly any camera that is made today, even your phone, and I'll tell you how to do it. In the first image we have a photo of a cat with a poor composition. There is too much dead space in the bottom right of the photo, That cat is too far off to the left of the image, and he's placed up too high, causing him to look out of the frame, which to me, causes unnecessary tension to the photo. In the second image we have a better composition. The cat is positioned better in the image, as he is sitting lower in the scene. He's looking more into the frame, as opposed to out of the frame. Setting up the image like this, causes the photo to have a little less dead space around him, which I think is more appealing. 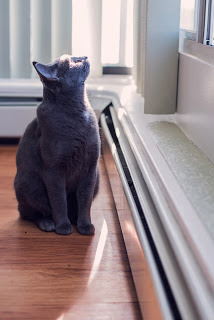 To get and even better composition for a vertical shot like this, it would be ideal to get a little closer and fill the frame even more with the cat, making sure not to cut off important parts of his body. You could also go horizontal with an image like this as well, making sure to keep the same framing of the cat, which would give us a better feel of what the cat may be looking at. But, ultimately, I think vertical was a better choice for this photo, due to the over exposure of the background. Now that you have better composition, the next step to taking a great photo is lighting. You can have an amazing camera and lens, but if you don't use proper lighting to your advantage, you're photos may still turn out dull. When I'm talking about lighting, I don't necessarily mean using flash, or studio lighting. I also mean using natural lighting, like outdoor light. If you're taking photos indoors, think about how the light is playing with the room, and set up your subject accordingly. If I'm doing indoor head shots, and I don't have my lighting kit, I like to use a window as my light source. I get my subject to look out the window and let the natural light do it's work. The more light available for your image, the less work your sensor will have to do. I'll show you an example of two shots. One I took with a Nikon d750, and the other with an iPhone. The photo of the man, was taken on a Nikon d750, and the photo of the cat was taken with an iPhone. As you can see, it doesn't matter what type of camera you use. As long as your composition and lighting is good, your camera will be able to produce really nice photos. There are tons of other tips for making sure your photos turn out really well, but these are two tricks that everyone can start doing right away, and your photos will turn out a lot better because of them! I've been asked this question a lot from people who are just starting out. I'm going to give you the most simple explanation of an f-stop that I can think of. No matter what lens you have, it has an opening that can be made wider, or narrower. This opening is called your lenses f-stop (or aperture). It is designed to let a certain amount of light in to your camera. The lower the f-stop that your lens can go, the wider the opening will be, which allows more light in to your cameras sensor. These numbers often go as low as f/1.4, f/1.8, or f/2.8 which is great for shooting in low light situations. By being able to utilize these lower f-stops you can achieve faster shutter speeds, and not have to rely on boosting your cameras ISO (sensor sensitivity). Now, In conjunction with letting light in to the camera the opening also plays another huge role. It creates depth of field. Depth of field is essentially the area that is in focus. The lower the f-stop, the shallower the depth of field, which means less of the image is in focus (from front to back) which really helps to separate your subject from the background. Here is an example. If you are taking a close head shot using an 85mm f/1.8 lens and focus on your subjects eye, the background will melt away almost instantly. The eye will be in focus, but everything from the ears and beyond will become blurry - very cool. NOTE: Be very careful if you are shooting at lower f-stops. Because the depth of field is so shallow, the slightest movement can cause your photo to be out of focus. Try not to focus and recompose, but rather get your focus point where it needs to be and try locking in your focus a few times to make sure you've got the shot. The higher you set your f-stop (something like f/8, f/11, f/16) the more of the image will be in focus. This is great when you are taking landscape photography, group photos, or using flash in a studio. There is a lot that goes in to using your f-stop properly, and takes some practice, but knowing what it is, and how it works is half the battle. The f-stop is your lenses aperture. The lower the number, the more light is let in to your camera. With a lower number, you can also get a really blurry background.